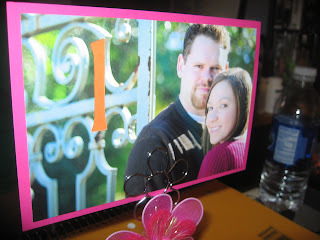 The DIY Bride: Revision of the Table Numbers.. Check! 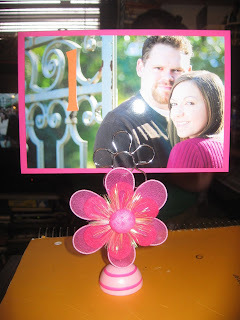 My fiance found these adorable photo holders at Hobby Lobby marked 40% of $1.67, and since we loved them, I knew that my original table numbers weren't going to work as well. Here is what we plan to do now! It is kind of hard to tell, but what I actually did was enlarge some numbers in a Word document to 200 and print them off. then I took some scissors and cut out the numbers. Then, I printed off one of our engagement pictures. 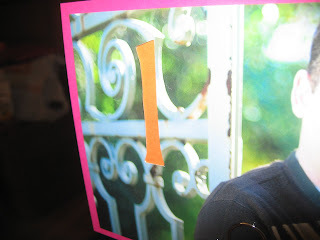 I taped the number backwards on the back of the photo, and cut around it with a box cutter. 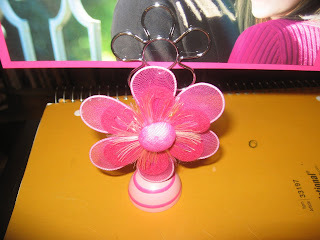 Then, I taped a small piece of orange cardstock behind it then glued the whole thing to a piece of hot pink cardstock. I will post actual directions once I get started on making more of them! In this last one, you can kind of see where the photo is separate from the orange paper and where I cut.